Just when I was giving up on the prospect of ever finding a Bluetooth headset that was as good as my old Sony Ericsson HBH-35 headset, I came across some positive reviews of the Plantronics Voyager 510 USB Bluetooth headset, and decided to take the plunge and get one. The Plantronics Voyager 510 is supplied with the USB to Plantronics charging cable, a charging stand, and a USB Bluetooth dongle, as well as the setup software and manual on a CD-ROM. For the purpose of this review, the Plantronics Voyager 510 headset was paired to a Nokia N73 mobile phone, and a desktop PC running Microsoft Windows XP. The Plantronics Voyager 510 is very simple to use, not to mention extremely comfortable. The headset comes with a choice of 3 foam earpieces, and once the earpiece is fitted, it makes the headset very comfortable to wear, added to that the back section of the headset has a rubber covering, and it is clear Plantronics really do make this headset very user friendly. The headset is switched on by a small raised button on the main ear retained section, and below this are volume buttons to raise and lower the volume. On the microphone boom, is another button to press to answer a call. Simple. When switched on, the Plantronics Voyager 510 headset has a bright flashing blue LED to indicate it is working and paired to a Bluetooth device. Now personally, I have always been a sucker for gadgets with blue LEDs, but this LED is very bright, and very obvious. I certainly would feel nervous wearing it if I were walking though areas with high street crime rates, although in a car, or a building, it would be absolutely fine. It depends on where it is being used basically, but it is certainly something to be aware of. 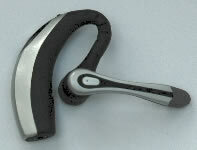 The Plantronics Voyager 510 uses a permanently enclosed rechargeable battery. The Plantronics Voyager 510 has demonstrated excellent battery life, easily on a par with my older Sony Ericcsson HBH-35 headset, and far better than the useless Sony Ericcsson HBH-60 headset. The Plantronics Voyager 510 does however suffer from having a custom connector for charging. Yes, it has a USB connector at one end (which is a good thing), but at the other end is some custom Plantronics charging connector. I really wish companies would standardise on a generic charging connector standard at the device end, such as the mini-USB connectors. Having to have separate connectors and charging systems instead of one standard cable and connector is annoying. The audio quality of the Plantronics Voyager 510 is excellent when used with a mobile phone, the Voyager 510 headset is actually quite loud, and more often than not, the volume needs to be turned down - this is a great change from other Bluetooth headsets where they are not loud enough. Reception audio quality is very clear, although the boom microphone does need to be carefully placed in order for the receipient to hear clearly. Quality is clear and easily audible even when outdoors for the person wearing the headset, although for the person at the other end, understandably, it is harder to hear under those conditions. When the Plantronics Voyager 510 is used with the Bluetooth dongle for VOIP calls, the audio quality is definitely not as clear as with a mobile phone. There is a small amount of audible background noise throughout a call using this method, both for the person using the Voyager 510 headset, and the recipient. Having said that, personal experience of using the Voyager 510 in a Skype conference call with 7 other people on the call for a 1 hour duration call proved to be perfectly useable, it was just a bit irritating having noise on the audio. 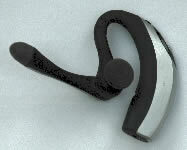 The Plantronics Voyager 510 USB headset comes complete with a Bluetooth USB dongle (Model number: PLT-BUA-100). The specification claims a range for the Bluetooth dongle of 10 metres, and during testing, it certainly seems that the headset can be separated up to that distance without significant reduction in audio quality. The included Bluetooth USB Dongle plugs, unsurprisingly, into a USB port on a PC. The installation software supplied is for Microsoft Windows XP, and the installation of the software proved to be straightforward. The Plantronics configuration software is simple to use, and enables the Bluetooth headset to be configured for use via VOIP software without any problems. Once the configuration process is complete, the Bluetooth headset pairs with both the Bluetooth dongle and a bluetooth mobile phone seemlessly, taking calls via the mobile phone and Skype without any fuss. Before the headset pairs with the Bluetooth USB dongle, the USB dongle flashes a violet LED. Once the headset has paired with the Bluetooth USB dongle, the USB dingle flashes a Blue LED. Has an annoying bright blue LED on it that screams "steal me"
If you need decent sound quality, long battery life, and can live with looking like the Borg, then the Plantronics Voyager 510 USB is an excellent headset. Its ability to pair with both a mobile phone and a VOIP enabled PC is a major plus point too. About its only notable annoyances are the sound quality for VOIP, and the annoyingly bright blue LED. Other than that, highly recommended.